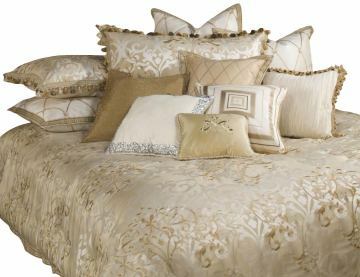 This comforter combines layers of color and texture to give luxury new depths, which inspired by romantic dreams of ball gowns and fairy tales. Feature medley pillows with embellishments in addition to the extreme of this Luxembourg Bedding Set. All decorative pillows feature hidden zippers and feather inserts. This set is available in either a 13-piece King set, or a 12-piece Queen set.